Once we came down from the cable car, my friend Ed and I walked around Genting Hotel to look for a place to have our lunch. Finally, we settled for Coffee Terrace. Coffee Terrace offered buffet as well as ala-carte. We went for ala-carte. We looked through the menu and made our orders. While waiting for the food to arrive, I took some more photos of the interior. These were items displayed on the wooden shelf. 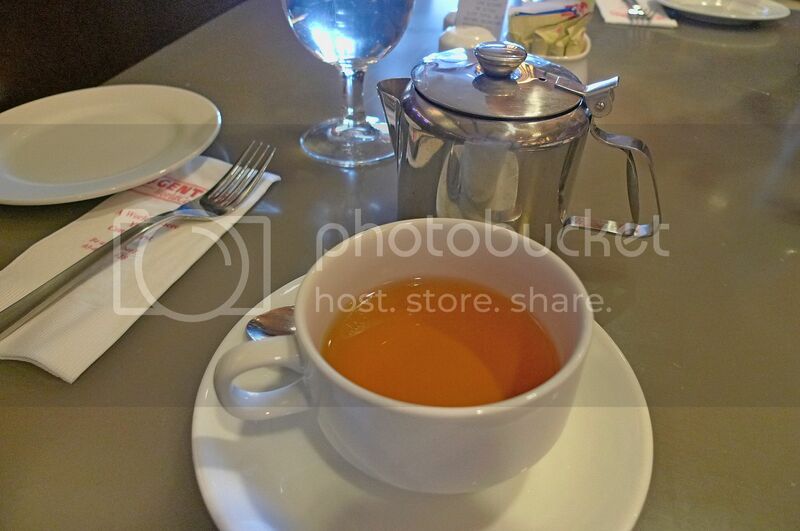 I was having a little cough, so instead of drinking something cold, I went for hot tea. Finally, our food arrived. It did take quite long and I was hungry! My friend ate beef stroganoff. I hope I got the name right! 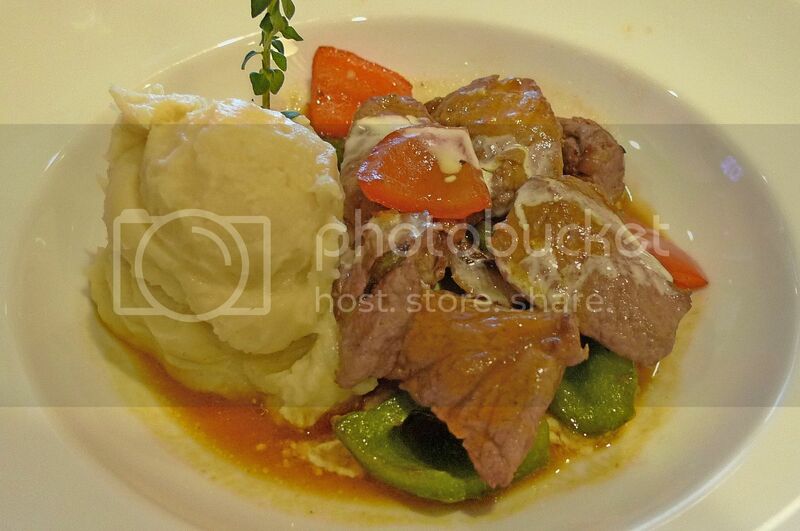 If not mistaken, I think it is a Russian dish of sauteed pieces of beef served in a sauce with sour cream. My friend said it was so so only. I ate a little of the beef and agreed with him. Mine was baked salmon. It was not too bad, though I would not say it's good! The bill came up to RM82.80 which was pretty pricey to me! But I did not mind splurging a little, so it was OK.
After lunch, we went over to First World Hotel and had a tour of the Indoor Theme Park. 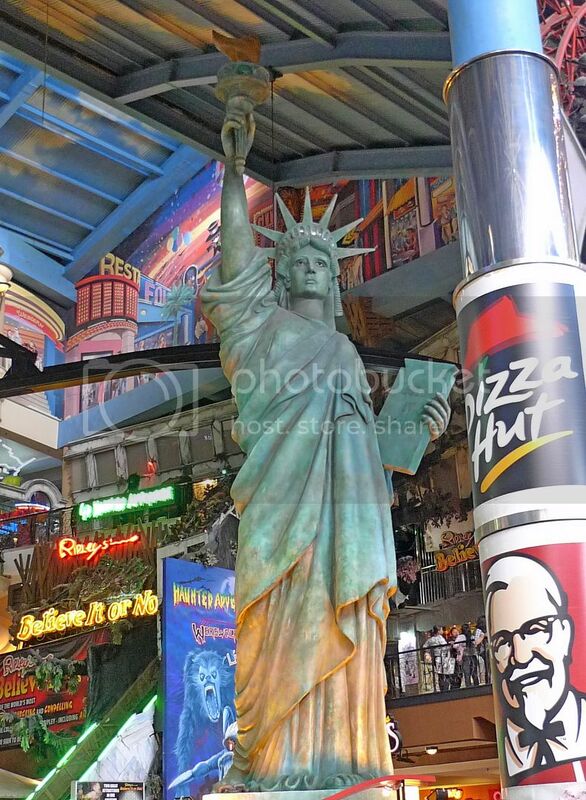 Anyone who enters this Indoor Theme Park will not fail to see this Statue Of Liberty. 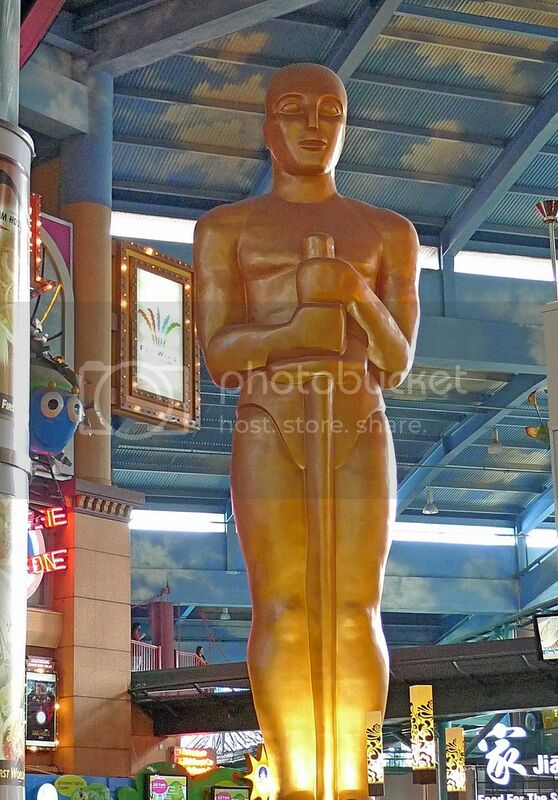 And this Oscar statue opposite. 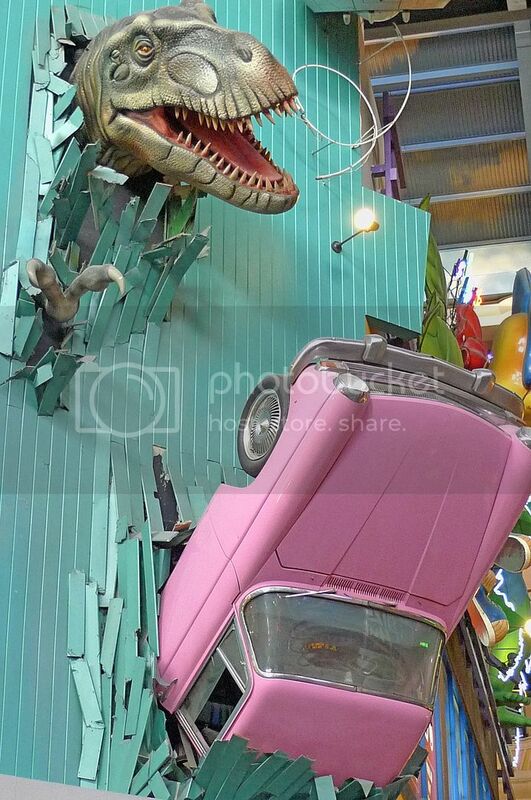 There's a T-Rex's head breaking out of the wall trying to attack an overturned car. And of course there was my favourite Superhero, who is none other than Superman! But they replaced his S logo with a G! No prize for guessing what that letter G stands for! By the way, anyone knows who is this Superhero? Lots of shops and stalls selling stuffs. I did not buy a single thing. My friend Ed bought some clothes from FOS. Look at these unique lantern balls! 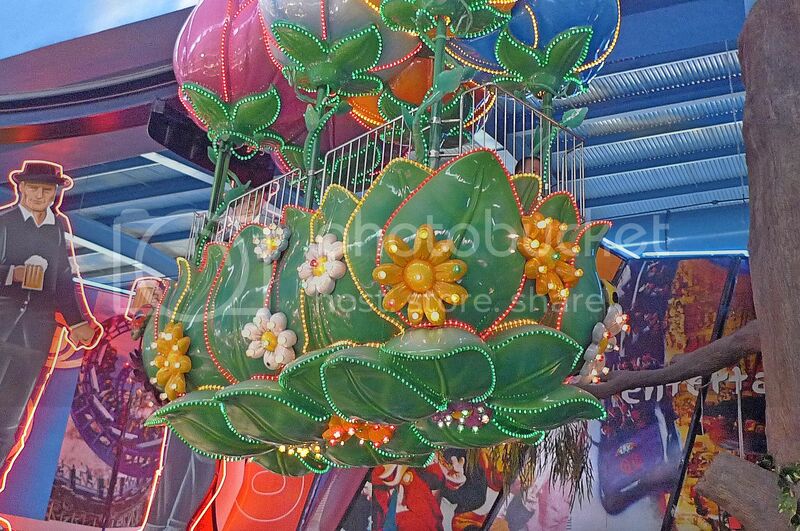 There are many indoor theme park rides, but I just took photos of a few of them only. Below is the Venice Gondola ride. 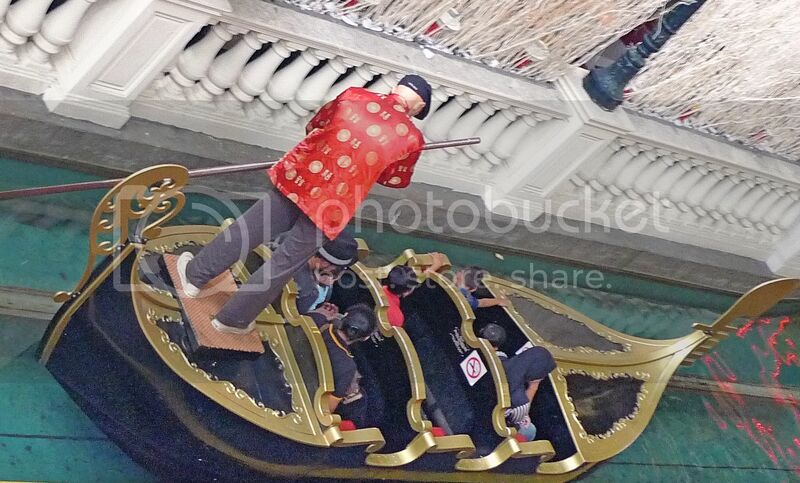 By the way, the man steering the gondola is not real, haha. 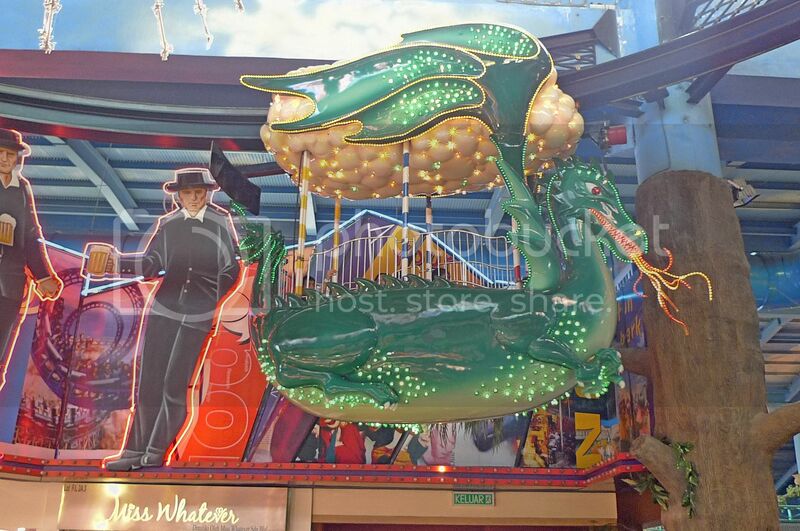 This is a Rio Float. They come in different designs. This is what they called a Reindeer Cruiser. A Rio Float with Reindeer Cruisers in the background. After all those walking around, we decided to have a drink at Starbucks. It was here that we took out our laptops and did some online surfing. I had wanted to change my blog's template for quite some time but did not really know how so I asked Ed for help. He showed me some Blogger templates. I chose one which I liked then asked him to teach me how to replace my previous template with the new one that I am having now. It was all done within a matter or minutes! Simple! 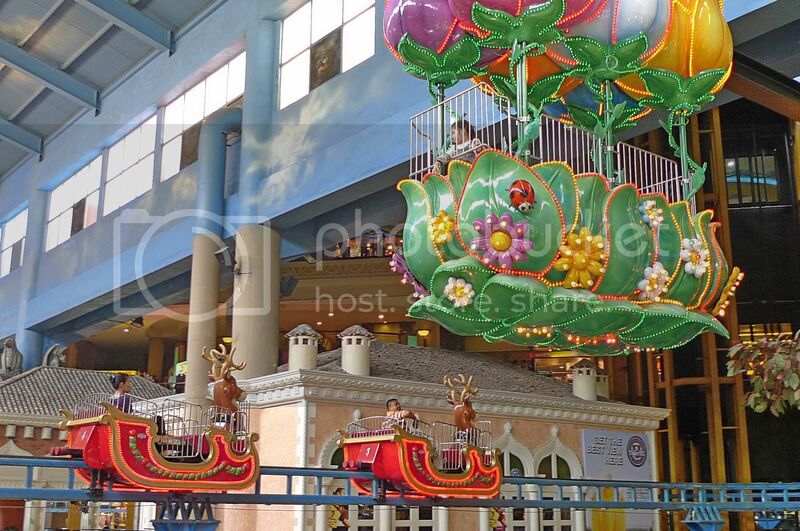 And that, my dear readers, is the story of how I changed my blog's layout at Genting Highlands! Nothing dramatic or exciting about it, I'm afraid! Sorry if this seems like an anti-climax but that's how I make you read Part1, 2 and 3 of this story! Haha! Not allow to enter the Casino? Don't tell me you are under age! Haha! 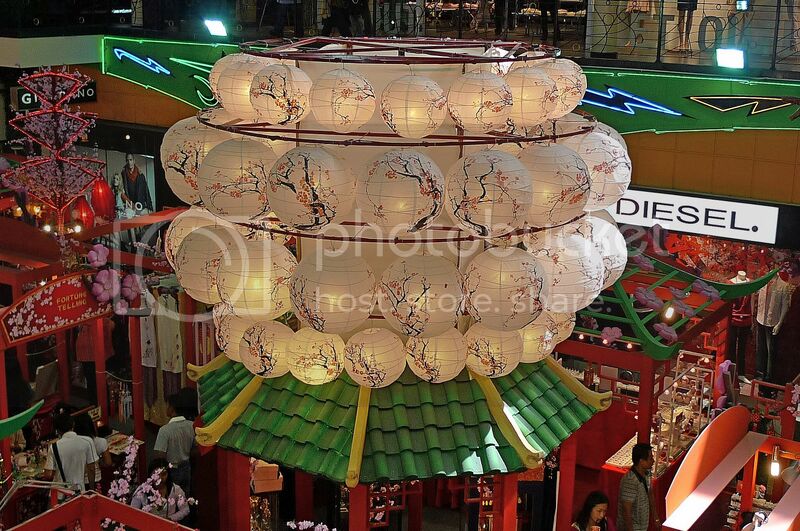 Love the lantern balls something different from the rest and the food is certainly pricey. You were denied entry to casino coz you wore sandal lah..could not be possible for wearing shorts in that weather. Food price there seems to off the chart. I had a rude awakening too few years back. hi, i enjoy reading you. and seldom comment, but this time i shall, just to get into the fun of it.looking at those pictures it does not tempt me to go there. i have never been there, and from what i see of the pics and ur report, i dont want to go there. as for the casino, i m going to make a really wild and improbable guess. ur friend is an angmore and can go in anytime and u r malaysian, and malaysians need to put down a big deposit before u can go in and u dont have that deposit. haha. the reason why i say this is because i was in cambodia, and there the casinos are run by malaysians, and the country has a rule that prevents local cambodians from being allowed to enter the casinos. foreigners can. so you won the guessing cable car duration game? 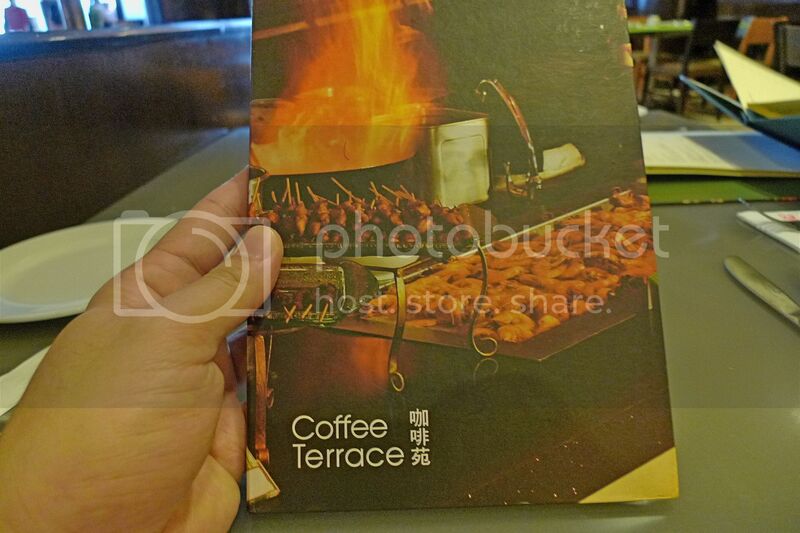 haha..
Coffee Terrace used to serve very good Hainanese chicken rice. The casino still observes some dresscode for guys. I think that is good to maintain a certain casino standard. You were not caught offguard, were you, Foong? No laptop to be carried into the casino bro and you rather hang on to your baby than leave her in a locker. Right? Also no camera allowed and you rather hang on to it and refused to lock in the lockers for fear it got feet and wings? hey nice one. ;) i guess maybe cz ur dressing or ur heights. just guessing ny. hehe. eat in Genting sure expensive one. Even McD cost more there. I agree with Bananaz. You don't want to be apart your laptop and camera. Or was it because of the dress code. Wear batik or collared short or some nonsense like that? The place looks like a semi-indoor amusement park, with a bit of casino themes, and a bit of a place we have in the California called Universal Studio Park. The superhero you asked about, at first glance, looks like Hulk but at closer look, I don't think I'm right. Ahhh, Genting, might go up there next week! War...coffee Terrace? :p The deco looks so extravagant. 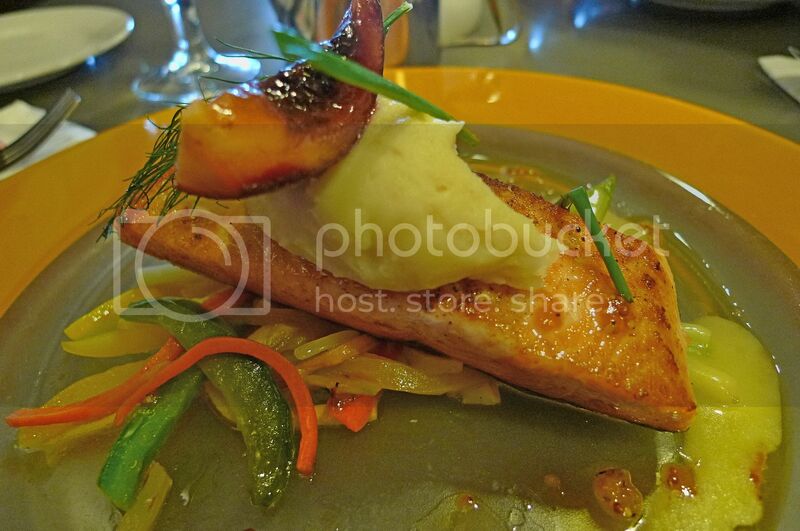 Wow...what a bombastic word for a dish. Haha :D But I think it is ok since it is Russian. Goodness...the bill came up to...RM80++ for 2 dishes? Wow...they really sucked your blood up there huh! 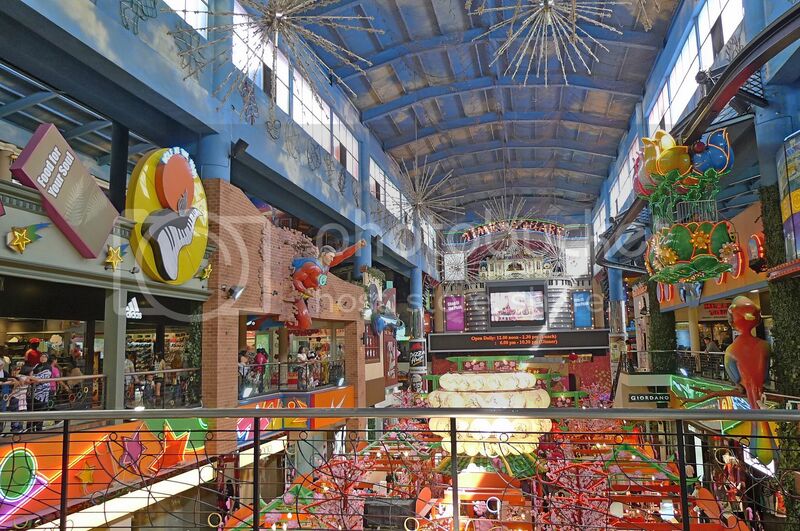 Awww...it's been such a long time since I last went to Genting and I certainly missed a lot of stuff there. u're under age? impossible! wahahaha..
wah.. genting changed so much already..
You wore slippers or you had your camera with you, and so was not allowed in? 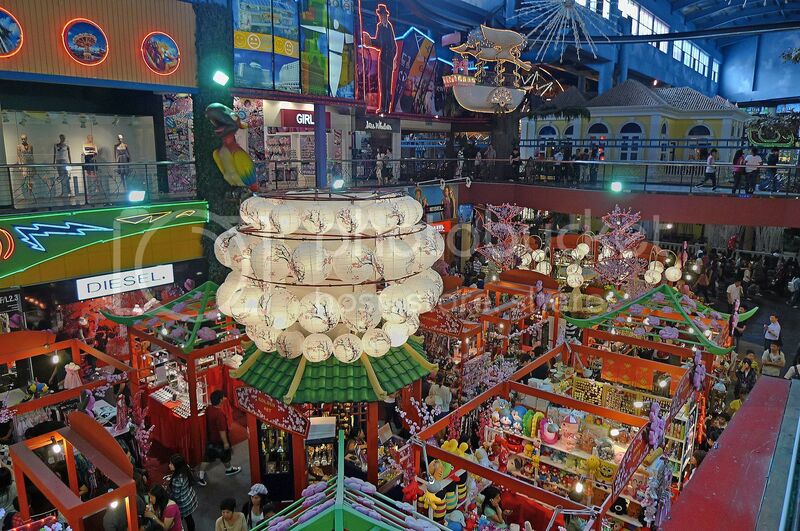 Everything at Genting is so pricey. The cheaper food can be found at the casino eateries, or just take fast food (Marrybrown?). 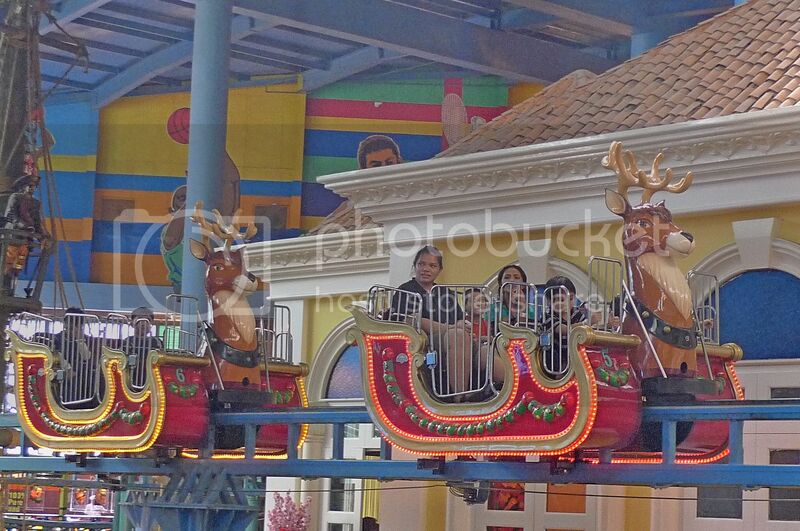 so you took so many photos in the indoor theme, did you take any ride there?? hmmm, no allowed to go into the casino?? let me guess.. you guys were wearing short pants?? or because you guys were carrying your laptops and your camera with you?? You brought your laptop to Genting?! I would have thought a camera...haha. Oh so that's how you changed your blog layout....all the way up in the hills! Anyway, nice layout. looks like there are a lot of changes since I was there last... which is VERY VERY long time ago now haha! That superhero? I have no idea? 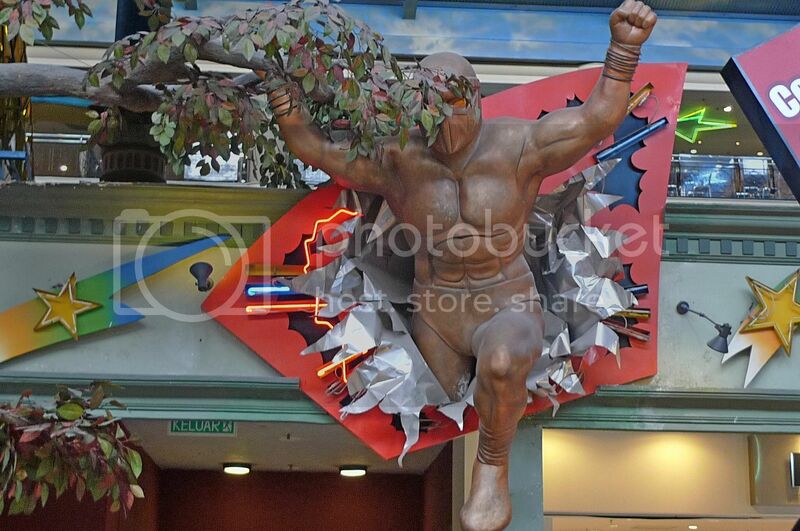 Genting hero maybe? haha! You were wearing shorts. That's why you could not get in? BTW, when will you start writing your Guilin posts again? I had just done with my last post! Or you had done yours too? the coffee interior looks nice. nvm la... worth paying for the ambience you get! 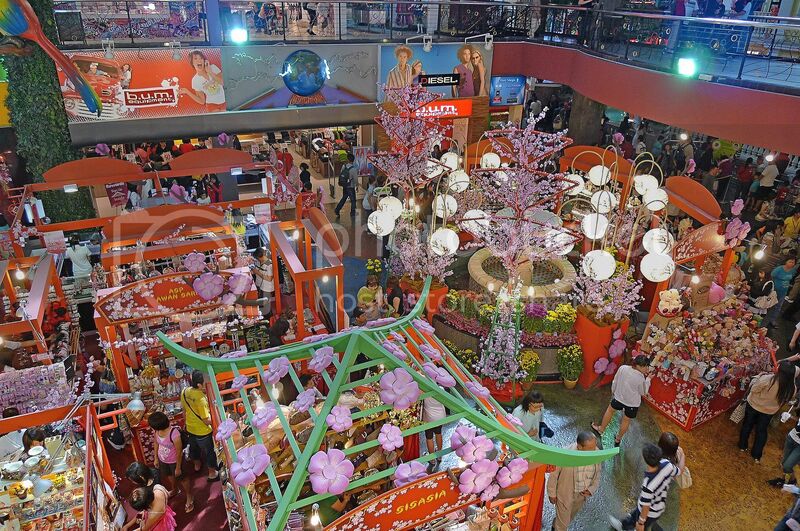 When are you going to Genting Singapore? 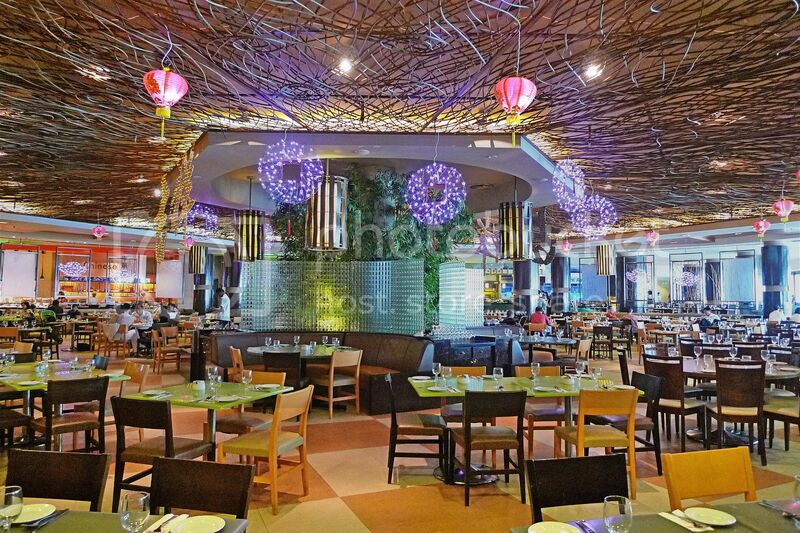 cheahs@n, yeah nice lantern balls and food is damn pricey! wenn, glad you find my story interesting, haha! creating my life, thanks for being the silent reader and commenting once in a blue moon! LOL! So I guess you are all grown up? Haha! Cos adults normally don't find these photos very interesting. Haha, your guess is wrong. My friend is a Malaysian Chinese just like me. And we don't need to put down a big deposit to gamble in Genting casino! kenwooi, what you mean I won? I am the contest organizer lah! Haha! happysurfer, really? Have not tried their hainanese chicken! The Genting casino is not so strict anymore. Last time rules were wear batik or suit to enter, now wear T-shirt (no collar) also can enter! Of course singlet and shorts and slippers like going pasar malam cannot lah, haha! bananaz, no "Pandas Not Allowed" sign there, haha! Wah! How you guess? Must be following my tweets! Haha!! CH Voon, oops! looks like I commit the same sin as you - comment too fast didn't read your next comment. LOL! Dear Panda you no need "mum-mum" blogging during lunch time? Or had too much of 'sinful' food over the 15 days now on diet izzit? 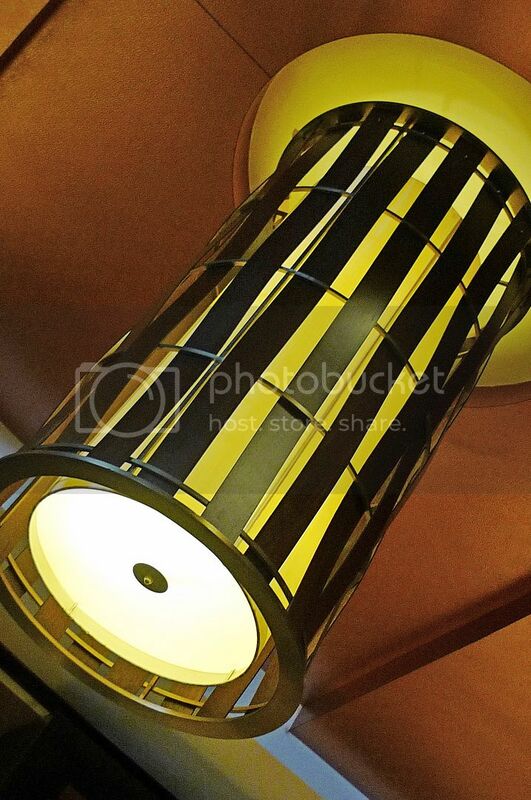 tekkaus, the deco is nice. Also quite nice ambience. 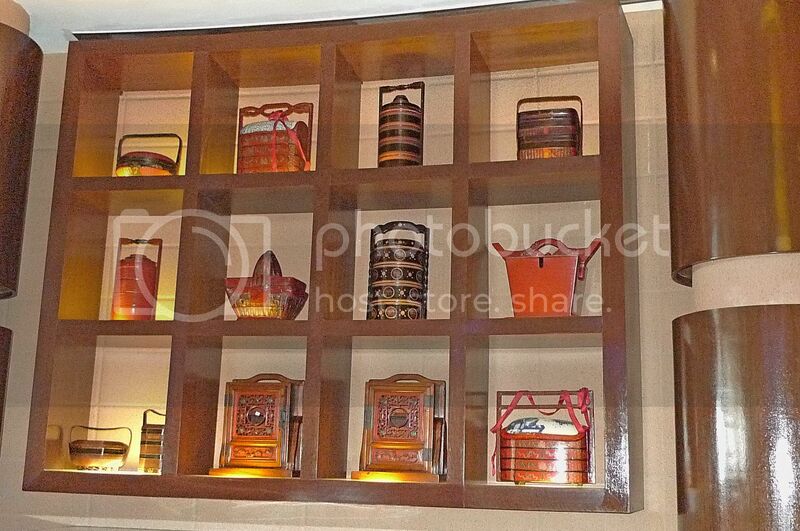 No, they are not lunch boxes. Not sure what they are! yeah, really expensive but I don't mind to splurge once in a while. I look damn young? Haha! I can prove my age with my IC, so that's not a good reason! LOL! donna, why impossible? I'm 16 going on 17. Haha!! shingo T, you're almost correct but not quite, haha. Even the fast food is pricey in Genting! LOL! SK, thanks for the claps, haha! Geng or not? LOL! Didn't take any rides there - not going to endure another round of queuing after that 2 hours queue for cable car ride!!! ladyviral, wow! So long didn't go up Genting? 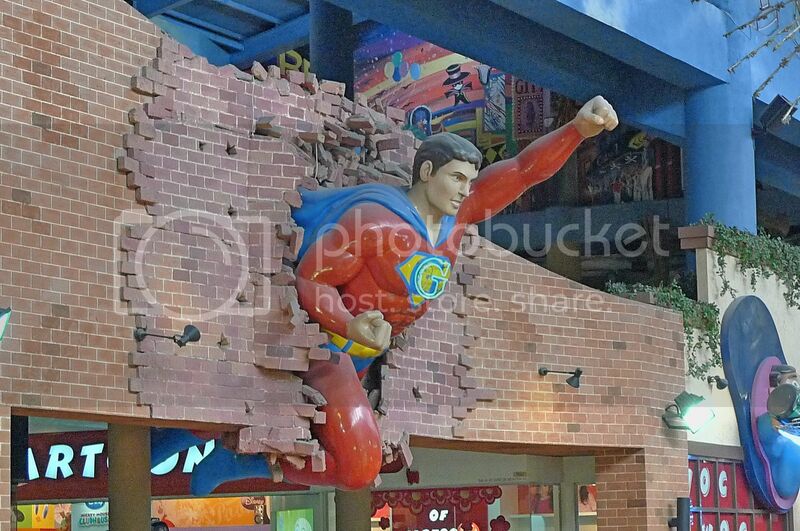 Genting hero? Haha! jam, no I was not wearing shorts. Haha! When to resume my Guilin posts? Er...er....er....not sure when!!! Wait till I finish with this Genting post, and the Lake Kenyir post, then I will continue, I think! Provided I don't start blogging about my Bali trip by then, haha!! eiling lim, yeah I guess I'm paying for the ambience, haha!